This wonderful 1958 mid century modern home, designed by architect and Philadelphia SAH member Irwin Stein, is for sale by the current owners who are looking for a buyer who will treasure it as much as they do. They are hosting an Open House on Sunday, April 12 from 1:00 to 3:00 p.m. at 2 South Providence Road, Wallingford, PA. Almost all of the original details are intact. The 2600 square foot house has 4 bedrooms, 2 full baths and one half bath. The attached 600 square foot office has four rooms and a powder room. It can easily be converted to an apartment. The home is situated on .75 acres of land, has two patios and in another week the yard will be filled with over 1,000 daffodils. The interior boasts soaring ceilings, redwood paneling, tile and hardwood floors, ample natural light, two wood burning fireplaces, cove lighting and a gorgeous open staircase. The home has been featured on the cover of Atomic Ranch Magazine, on houzz.com and apartmenttherapy.com and was voted one of Philly’s “Amazing Spaces” in Philadelphia Magazine. Winterthur Members $5. Nonmembers $15. For GPS and online mapping services, use: 5105 Kennett Pike, Wilmington, DE 19807. Winterthur recommends using Mapquest for directions as Google Maps sometimes gives inaccurate directions. 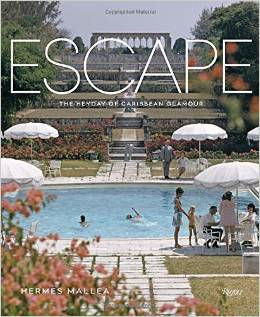 Hermes Mallea, architect and author, takes us on a nostalgic celebration of the glamour of warm-weather destinations in the Caribbean and Florida, from the great estates of ambitious patrons, including H. F. du Pont’s retreat in Cuba, to the most exclusive resorts of the mid-20th century. Through iconic photography capturing the cultural mood at the moment when social codes relaxed from the formality of the Gilded Age to the spontaneity of the jet-set era, Mallea takes you inside a world of beach parties and costume balls set in lush tropical landscapes, of rarefied resorts and fairy-tale private estates. Among these idealized settings blossomed the resort lifestyle of international celebrities, from Marjorie Merriweather Post to Babe Paley, Princess Margaret to David Bowie, whose escapades are spectacularly captured in these pages to make the region’s bygone glamour come alive. Saturday, April 18 at 10:00 a.m.
(rescheduled from October, when heavy rain forced postponement). The fee is $15, or $10 for EFHS members. The tour will occupy about one hour and 45 minutes. Comfortable walking shoes are advised! The upper or eastern part of East Falls, formerly known as Queen Lane Manor, within a few-block area contains excellent examples of a range of architectural styles: grandiose Beaux Arts, clean and crisp International, Art Deco, Georgian Revival, Gothic revival, Jacobean, and more. 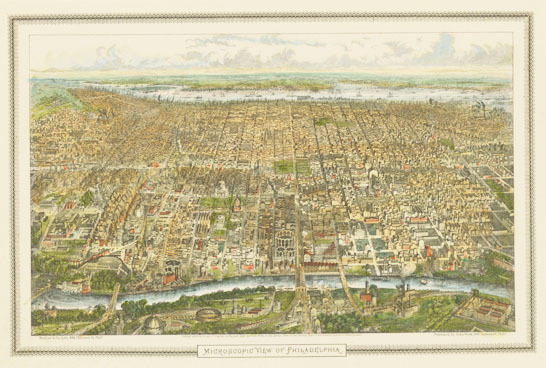 Creating and leading the tour are Steven J. Peitzman, professor of medicine at Drexel University and a long-time architecture enthusiast; and Ken Hinde, lecturer and tour guide formerly with the Foundation for Architecture and the Philadelphia Society for the Preservation of Landmarks. The history of the Queen Lane Manor district, The Oak Road, the Queen Lane Reservoir and Filters, and more, will also be discussed. The postponement in fact allowed the tour leaders to conduct further research about the region and its buildings – it’s more interesting than even they had imagined! The tour will meet at the Revolutionary War monument on the southeast corner of Queen Lane and Fox Street. There is ample street parking in the area, and the meeting location is a short walk from the Queen Lane Station of the Chestnut Hill West Regional Rail Line. The K bus stops at the location. For more information, contact Steven Peitzman at peitzmansj@gmail.com. 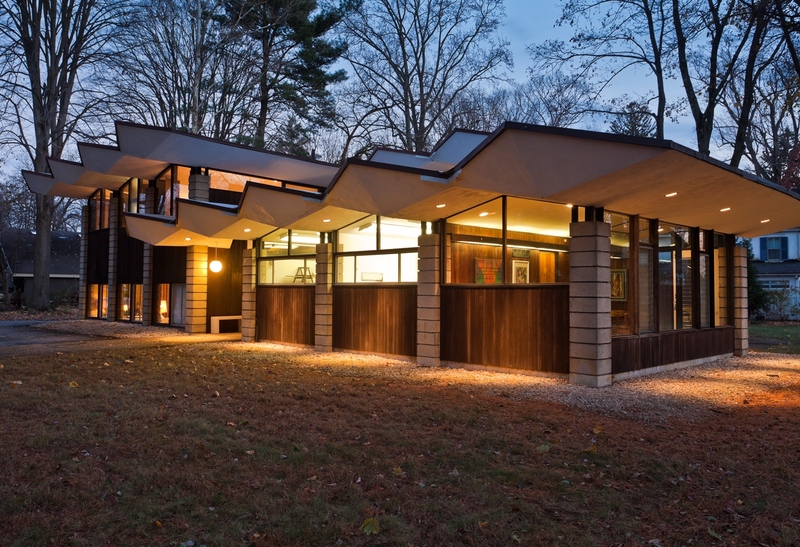 As part of The State Museum and Archives’ 50th anniversary commemoration, the Pennsylvania Historical and Museum Commission (PHMC) is hosting a juried photo exhibit at The State Museum focusing on Pennsylvania’s wide variety of modern architecture. 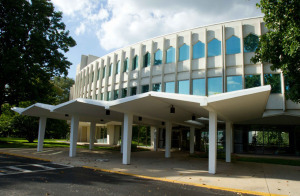 Featured will be submissions of photographs that display examples of mid-20th century architecture constructed in Pennsylvania between 1930 and 1980. Entries may depict exteriors, interiors, and/or details of roadside architecture, schools, religious buildings, homes, commercial structures, recreational sites and other modern buildings. Entries will be received online through June 30, 2015. The exhibit will open to the public on Sunday, October 25, 2015, and close February 28, 2016. We are currently seeking submissions via www.callforentry.org, a professional art entry website. Entries will be accepted through June 30, 2015. Dennis Hockman, Editor-in-Chief, Preservation magazine, and Senior Director, Editorial+Creative, National Trust for Historic Preservation, Washington, D.C.
TOUR 3:30 – 4:30 p.m. Join exhibition curators, William Whitaker and Paul Hirshorn for a lively discussion and tour of the exhibition. Taking on the subject of architectural symbolism and communication during the late 1960s was a radical move that opened up new avenues of artist expression and narratives about the development of roadside commercial architecture in the United States. Steven Izenour and Paul Hirshorn had been sensitized to the subject through their work with Denise Scott Brown and Robert Venturi and found themselves attracted to the strong architectural character of the White Tower hamburger chain. In this talk, Paul Hirshorn will share his insights into this remarkable example of architectural ingenuity tied to a corporate purpose and the role that he and Izenour played in uncovering its enduring significance. Paul Hirshorn was Head of the Department of Architecture at Drexel University from 1986 to 2012, and a member of the faculty since 1974. Following architectural studies at the University of Pennsylvania and Cambridge University, he worked for the firm of Venturi and Rauch. Eero Saarinen’s David S. Ingalls Hockey Rink on the Yale University campus “is deliberately not an ordinary building.” Visually compelling in its sculptural forms, the structure is composed of a huge 300-foot parabolic arch held in place by a complex tension grid of cables. As the building neared its 50th anniversary, Yale commissioned Kevin Roche John Dinkeloo and Associates to direct the refurbishment, updates and building expansion to address the needs of the current and future Yale Hockey Program while preserving this Architectural Landmark. 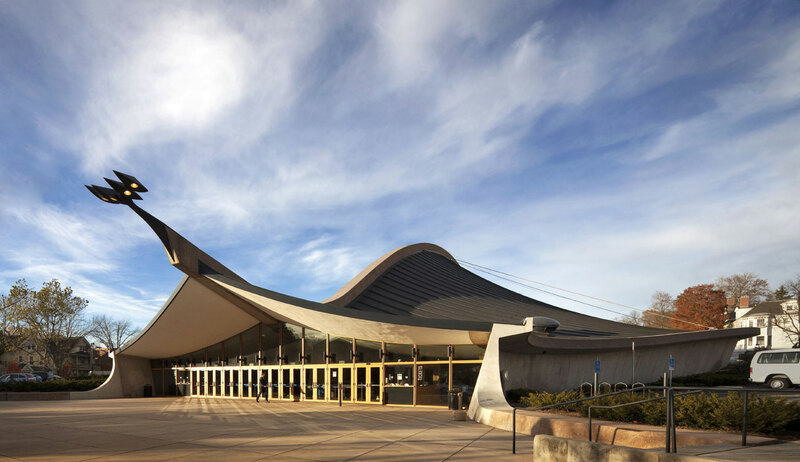 Ingalls Rink was completed in 1958 and renovated in 2009 by KRJDA, the successor firm to the Saarinen practice. In their renovation and refurbishment of the fondly referred to “Yale Whale”, KRJDA drew on archived sketches and former Saarinen employees to completely update and add much needed additional space with minimal disturbance to the original design. In addition to the underground extension, the rink received a new playing surface, a modern media and broadcasting area, and a new insulated roof was installed while preserving the original oak roof timbers. This special full-day tour and hockey game offers guests a unique perspective to understand the structure from the perspective of its designers, its players and the people who maintain and care for the site. The day’s speakers include Wesley Kavanagh, Principal, KRJDA, Wayne Dean, and Alice Raucher, AIA Senior Architect/Major Projects Planner, Yale University Planning. The tour includes exterior and interior spaces including inner team spaces, a special tour of the KRJDA offices, pizza break at New Haven’s collegiate spot, Wall Street Pizza, and will conclude with the Yale Women’s Hockey team against Princeton University. Transportation to New Haven is not included but a limited number of spaces are available to car pool to and from the New Haven train station. The Houses of Louis Kahn: Where Are They Now? This article in the January 2015 issue of The National Trust’s Preservation Magazine and post to the Preservation Nation blog were written before the Clever house went on the market.